The Deer Task Force at A All Animal Control is ready to respond to your deer control issues promptly with a well planned and orchestrated control program that will fit your needs and budget. We are committed to total solutions to wildlife and human conflicts. A custom tailored plan will be provided for your community that will allow the best margin of safety and provide a total solution to meet your goals. A All Animal Control is well experienced in the use of equipment and technologies (i.e., drop nets, dart guns and firearms) that will provide the safety and services that you need for deer control! Our Sharp Shooters are well qualified to quickly and efficiently reduce the herd size for home owners, cities, business and governmental properties. Reducing the herd size will reduce the risk of vehicle accidents and browsing damage to area homes and businesses. A well managed herd will also be less likely to spread diseases such as Lyme’s and Chronic Wasting Disease. 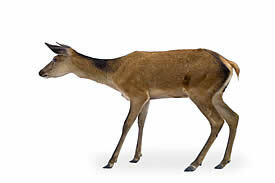 It is estimated that total deer damage from auto collisions, crop and timber losses reach at least $1 billion a year. Because deer are protected by game regulations in all states, as well as Canadian provinces, traditional methods of population control, such as hunting, often are impractical or illegal in such settings. We would strongly suggest that you contact your nearest A All Animal Control office for all of your deer control needs.